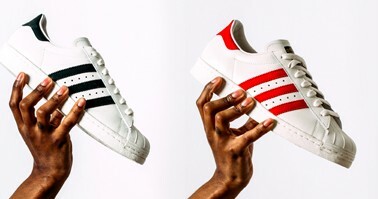 FANCY a new pair of adidas Originals trainers every month for a year? Mainline Menswear are running a competition that will give the lucky winner exactly that, a year’s supply of, at a guess, your favourite brand of footwear. To get your hands on a monthly box full of 3-stripe goodness see competition details below and then enter over on the Mainline Menswear website at mainlinemenswear.co.uk/competitions/adidas-originals-trainers, where you’ll also find all the rules and terms and conditions. From sport to street style, fashion to football, originals to outdoor and every in between adidas are certainly going all out covering every base in 2015. Having been the top sportswear brand for so long on Mainline Menswear adidas Originals wanted to kick off the year with a huge band, so we’re sharing an amazing competition with you courtesy of adidas Originals and Mainline Menswear. One lucky person can kit their feet out in “3-Stripe” glory for the whole of 2015 as we’re giving you the chance to take home a brand new pair of adidas Originals trainers every month for the next 12 months. You best make space in your shoe cupboard or wardrobe as twelve amazing styles of trainers could be yours. All you have to do to be in with a chance of winning this amazing supply of trainers worth well over £700 is leave your name, email address and mobile number below and we’ll pick one lucky person at random. That person can then choose their favourite pair from our selection online every month for a year. So what are you waiting for? Enter now to be in with a chance of winning this amazing prize courtesy of adidas Originals and Mainline Menswear.